ANN ARBOR, Mich. — Researchers at the University of Michigan Comprehensive Cancer Centerhave developed a new drug called AT-406 with potential to treat multiple types of cancer. 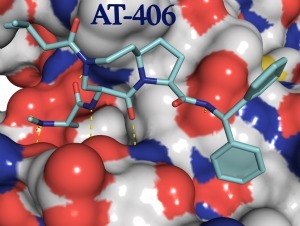 A study, published this week in the Journal of Medicinal Chemistry, showed that AT-406 effectively targets proteins that block normal cell death from occurring. Blocking these proteins caused tumor cells to die, while not harming normal cells. The researchers believe the drug could potentially be used alone or in combination with other treatments. The normal cell death process, called apoptosis, is what keeps normal cells in check. When apoptosis is disrupted, cells reproduce uncontrollably, which is a hallmark of human cancer. “Removing key apoptosis blockades in tumor cells is a completely new cancer therapeutic approach and could have benefit for the treatment of many types of human tumors,” says study author Shaomeng Wang, Ph.D., Warner-Lambert/Parke-Davis Professor in Medicine and director of the Cancer Drug Discovery Program at the U-M Comprehensive Cancer Center. Wang’s laboratory has been pursuing new cancer treatments aimed at this cell death pathway since 2003. His team designed and made AT-406 and tested it in the laboratory in 2006. The small-molecule drug hones in directly on the proteins – called inhibitor of apoptosis proteins or IAPs – that block cell death. The researchers found that AT-406 destroyed these proteins in cancer cells. Meanwhile, the drug had little to no effect on normal cells. In animal models, the drug shrank tumors but caused few side effects. The drug is designed to be taken by mouth, which researchers say will make it easier than traditional intravenous chemotherapies to administer. Patent applications covering the drug are exclusively licensed to Ascenta Therapeutics, a privately-held, clinical stage biopharmaceutical company co-founded by Wang. After extensive testing, Ascenta began the first clinical trial in 2010 testing AT-406 for cancer treatment. This trial, which is being tested in all solid tumors, is offered at the U-M Comprehensive Cancer Center, Duke University and the Mayo Clinic. Ascenta has also recently opened a second trial of AT-406 in high-risk acute myeloid leukemia at the U-M Comprehensive Cancer Center. Several more clinical trials are planned. Note to patients: AT-406 is still in early stages of testing. To learn more about clinical trials opportunities at the U-M Comprehensive Cancer Center, visit UMClinicalStudies.org or call the Cancer AnswerLine at 800-865-1125. Disclosure: Shaomeng Wang owns stocks and stock options in Ascenta and serves as a consultant for Ascenta.